How do you measure faith? Are you able to look at someone and say, oh, he has greater faith than I do. I’m sure such thoughts have not escaped you in your years at church or living around Christians. Faith may perhaps not be accurately measurable, not by mere mortals at least, but faith is certainly comparable. The analogy of the mustard seed for faith is a commonly known one, and in today’s study, we will examine how small that legendary mustard seed really can be. You may be familiar with this story – Jesus, along with Peter, James and John, went up the mountain for what we call the transfiguration, the remaining disciples, though left behind, we’re approached by the people, one of whose son was possessed by an evil spirit. Try as they might, the disciples couldn’t chase it out. When Jesus returned, all it took was a word from him, and the evil spirit was out. When the disciples asked him why, this was what Jesus said – faith. So little faith – the disciples, according to Jesus, had too little faith. That was why they couldn’t chase away the evil spirit. Not because they were out of practice. Not because they didn’t train hard enough. Not because they did it wrongly. Not because they didn’t want it enough. Not because the demon was too strong for them. Not because they were inferior. No. Simply because they didn’t believe enough. 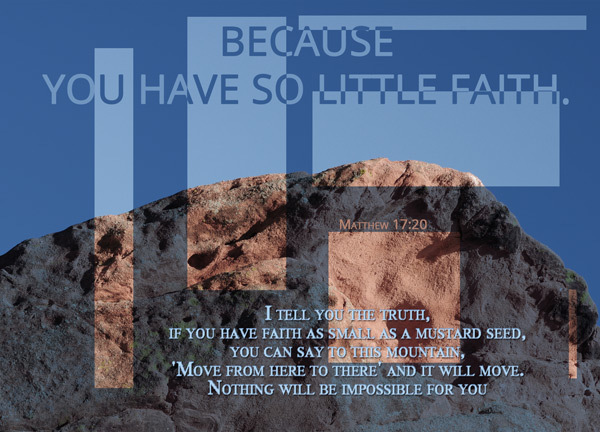 if you have faith as small as a mustard seed – the faith of a mustard seed. One of the most prominent analogies of faith that is pretty commonly used these days. In all honesty, all I know about the mustard seed comes from the Bible. But have you ever felt puzzled by this verse, or the context in which Christ had used this analogy in? Wasn’t he kind of contradicting himself? He had just reprimanded the disciples for having too little faith. And next he comes around and tell them that they just need the faith as small as a mustard seed? Mustard seeds are small. Very small. So what was Jesus trying to say! Really? Was he contradicting himself? You know, whether we realize it or not, we often place ourselves in the shoes of those disciples. Those who tried very hard to chase away the demon, but failed miserably so. Often, when we claim to take a step of faith, we don’t really believe that things will work out. We simply hope. And this hope is the worldly hope, not the Christian hope. The Christian hope is a hope that is certain. You know for sure it will happen. Worldly hope is a little girl grabbing the rails of the gates of her house for hours, waiting and hoping that her Mummy will come home in the next minute. There is no certainty, just a desire to get lucky. Instead of saying that the disciples had so little faith, perhaps it would be more appropriate to say that they were reprimanded for their lack of faith. They had seen Jesus do it so many times. They had seen it happen before. And when it was their turn to do it, they didn’t do it with faith, as the likes of Peter would later on – boldly declaring the name of God and confidently asking the lame man to stand up and walk. They did it in the hope that they will be lucky and the demon will be chased away. In Mark’s account of the same incident, a little other interaction between Jesus and the father was recorded. Jesus asked about details regarding the son, and the father provided them dutifully, adding that if Jesus can, please do something about it. Mark 9:23 – “‘If you can’?” said Jesus. “Everything is possible for him who believes.” – most certainly, at this point, the father did not believe. He, too, like the disciples, was hoping. Jesus was possibly his last resort. His last, desperate attempt to help his child. There was nowhere else to turn to. No one else who could possibly help him. And I don’t quite blame him for his disheartened attitude. How to believe? How, when his disciples had already failed, and everything else he had tried had already failed? It was way harder to constantly be living in hope and expectation, only to be disappointed again. It was hard to truly believe, because when the moment comes and what you believe was proven false, it is hard to take. Mark 9:24 [Article] Immediately the boy’s father exclaimed, “I do believe; help me overcome my unbelief!” – I believe it was in this moment where the father regained a little, puny bit of true, Christian hope. Did he have great faith? No, most certainly not. He admitted to his own lack of belief, but at the same time he also expressed his desire to learn to believe. At that moment, when he cried, ‘Lord, help my unbelief!’ That was likely when he began to have a mustard seed of faith. Small, new, insignificant, but sufficient. There is a difference between just hoping and believing. There’s a difference between hope and faith. There’s a difference between worldly hope and Christian hope. A small faith in the Lord goes far longer than a huge and loud, but worldly hope. As long as we keep our faith, and pin our hope on The Lord, everything is possible. Even if your faith is as small as a mustard seed. I believe this had nothing to do with faith but their unbelief. Some translations have rendered it wrong when they use faith but it was unbelief, there is a difference. Matt 17:20 says because of their unbelief!! Also this kind only goes out by prayer and fasting ( this kind was speaking of unbelief not speaking of the demon, their is nothing that the name of Jesus can’t deal with.